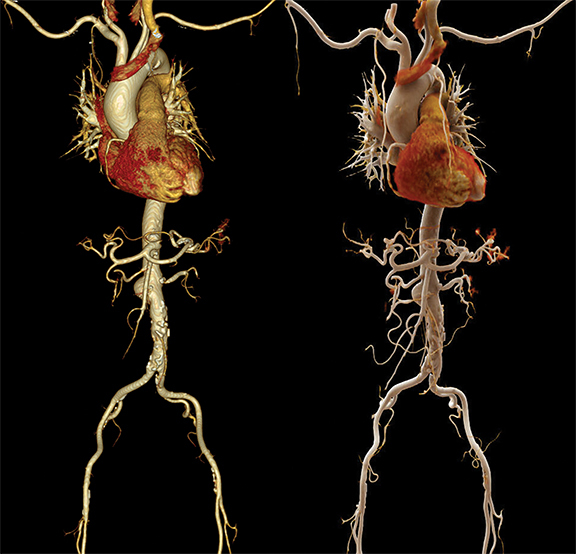 Several technical innovations in the last decade have significantly impacted CT angiography and the development of new contrast media injection protocols. Optimal intravascular enhancement is the direct result of the adequate timing of contrast media injection, iodine delivery rate (IDR) corresponding to the amount of iodine injected to the patient per second,1 and iodine attenuation secondary to the selected kV. In particular, two major technical advances have had major impact on contrast media injection strategies, (a) low kV acquisitions and (b) dual-energy derived virtual monoenergetic imaging at low keV levels. Our group is currently investigating new contrast media injection protocols for CT angiography, aiming to develop patient-tailored contrast media injection protocols for low kV and low keV imaging. 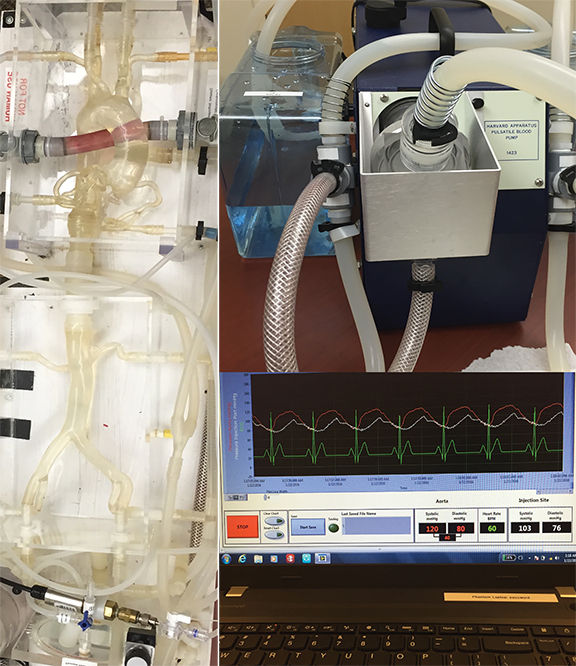 We used an advanced circulation phantom (Bayer-Schering, Wayne, NJ), built to simulate the effect of blood flow on contrast attenuation, to test varying injection protocols at different tube voltages. Our robust results have enabled us to implement these techniques into the injection protocol we are currently using in clinical practice. The aim of this review is to describe and illustrate our research, present our main results, and ultimately advance the conversation regarding optimized CT angiography protocols within the imaging community. Iodine attenuation increases at lower tube potentials due to decreased Compton scattering and greater photoelectric effect when photon energy approaches the k-edge of iodine (33.2 keV).2 As a result, the use of low tube potentials provides greater contrast enhancement, allowing for contrast media volume reduction when scanning at low tube potentials while maintaining acceptable image quality. This especially holds true with angiographic studies, which tolerate a slightly higher image noise and do not need a contrast-to-noise ratio (CNR) as high as parenchymal studies. Traditionally, scan and injection protocols have been exam specific; ie, developed for the organ or area of interest and carried out consistently for all patients. However, this approach is proving to be suboptimal and inconsistent with the trend of patient-centered treatment in medicine. This trend has manifested in cardiovascular imaging as the development and implementation of scanning and injection protocols completely adapted to the patient and their unique features. Since each kV level is strictly related to the vascular attenuation achievable with a given dose of contrast media, the decision regarding the optimal kV level for each patient is of paramount importance, not only to reduce the radiation exposure, but also to also lower the amount of injected contrast media. Choosing the optimal kV level, however, can be challenging in the clinical routine, as several factors must be considered. Fortunately, this challenge has been overcome with the introduction of automated tube voltage selection (ATVS) algorithms. This system is able to achieve patient- and clinical task-tailored examinations by varying the tube potential within the scan range based on the information derived from the topogram. This feature is particularly effective in a CT angiography examination,3 since the greater vascular iodine attenuation partially compensates for the higher image noise obtained at low kV levels, ultimately resulting in an adequate CNR. The ATVS algorithm has been shown to achieve significant radiation dose reduction while maintaining, and even improving, image quality when compared to body mass index-based fixed tube voltage selection.4, 5 Its wide implementation has significantly increased the application of low-kV-level (70–100) angiographic protocols. At our institution we have extensively investigated the impact of ATVS on image quality with coronary CT angiography6 and thoracic-abdominal aortic CT angiography7 using a 3rd generation dual-source, dual-energy CT scanner. Lowering the tube potential from ≥100 kV to 70 kV while using an injection of 50 mL and 40 mL of contrast media allowed for high-quality coronary and aortic CT angiography, respectively, (corresponding to 17.5g and 14g of iodine, respectively). These protocols used 37.5% less contrast media than what was needed to obtain the same image quality at tube voltages ≥ 100 kV (Figures 1 and 2). Dual-energy CT allows the differentiation and quantification of material composition using two attenuation measurements acquired at different energy levels. Different technical approaches have been developed by manufacturers to obtain dual-energy imaging datasets: dual-source CT scanners, equipped with two X-ray tubes operating at low and high voltages, respectively;8 single- source rapid kV-switching CT scanners, in which a single X-ray tube alternates high and low tube potentials;9 and single-source CT scanners equipped with dual-layer scintillating detectors, where the inner detector layer collects the low-energy data while the high-energy data are collected by the outer layer.10 A unique feature of dual-energy CT is the possibility of generating datasets of virtual monoenergetic images at specific X-ray beam energies (keV).11 High keV levels are characterized by less image noise, while low energy levels, approaching the k-edge of iodine, are affected by more image noise, despite their quality, and are also characterized by higher contrast resolution. The highest CNR obtained with virtual monoenergetic images is traditionally reached with a beam energy of 70 keV.12 However, with the introduction of a noise-optimized algorithm,13 this can now be achieved at even lower energy levels (40–50 keV).14 As a consequence, the amount of contrast media needed to obtain diagnostic examinations can be progressively reduced while lowering the keV levels. The application of the low kV and keV protocols in clinical practice brings us to an important question that must be addressed to optimize contrast media injection strategies: what is the optimal IDR and proper contrast media volume for each kV and keV level? To answer this question, we have investigated different injection protocols on aortic CT angiography using an advanced circulation phantom with a 3rd generation dual-source dual-energy CT scanner (SOMATOM® Force, Siemens Healthineers, Forchheim, Germany) equipped with two X-ray tubes powerful enough to enable high-quality low voltages examinations. The phantom is equipped with lung and body compartments connected by plastic tubing with accurate replicas of the pulmonary arteries, the ascending aorta, the coronaries, and the descending aorta with the renal and iliac arteries. The phantom was connected to a pulsatile heart pump (BS4, Harvard Apparatus, Holliston, MA) simulating the heartbeat and to an ECG simulator responsible for the CT scanner ECG-synchronization (Figure 3). We performed a dynamic acquisition on the same slice acquiring images for 99 seconds to analyze and compare the time attenuation curves resulting from different contrast injection strategies. To optimize the CT angiography protocol, we conducted a systematic study divided into two parts with the aim to determine the kV-specific minimal IDR and contrast media volume necessary to obtain diagnostic aortic intravascular attenuation (350 Hounsfield Units [HU] threshold). The first part of the study injected a fixed volume of contrast media. By varying the flow rate, the IDR was systematically increased from 0.1 grams of Iodine/second (gI/s) to 2.0 gI/s in increments of 0.1 gI/s for each available tube voltage (70–150 kV in 10 kV increments) to identify the minimum IDR required to obtain a diagnostic intravascular attenuation for each kV level (Figure 4). Our results showed that the mean flow rate used to obtain a diagnostic IDR was 2.4 ± 1.1 mL/s (range, 0.8-4.1 mL/s). The mean time to peak for the diagnostic IDRs was 39.72 ± 17.92 seconds (range, 24.0–77.1 seconds) while the mean injection time was 27.36 ± 16.63 seconds (range, 12.3–61.7 seconds). Excellent correlation was found between the injection time and the time to peak (r= 0.99). 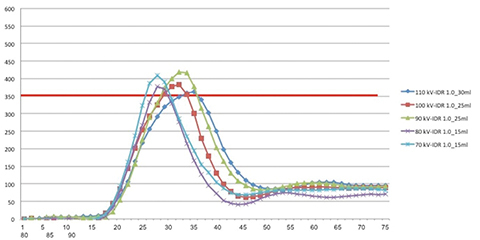 Time-attenuation curves showed different patterns depending on the specific diagnostic IDR related to each kV level. The second part of the study maintained a fixed IDR while varying the volume of contrast media for each kV level (from 10 mL to 50 mL in 5 mL increments) until the attenuation in the ascending aorta dropped below the diagnostic threshold of 350 HU. Only the kV levels below 120 kV (70-110 kV, 10 kV increments) were evaluated since in the first part of the study they required lower IDRs and consequently slower flow rates causing prolonged contrast media injection time and unacceptably long CT acquisition durations. Our results showed that diagnostic enhancement of 350 HU at the level of the ascending aorta was reached using 30 mL of CM for 110 kV, 25 mL for 100 kV, 25 mL for 90 kV, 15 mL for 80 kV and 15 mL for 70 kV. The mean injection time for acquisitions with the diagnostic CM volume threshold was 8.1 ± 2.5 seconds (range 5.6–11.1 seconds) while the mean time to peak was 20.3 ± 2.2 seconds (range 18–23 seconds). 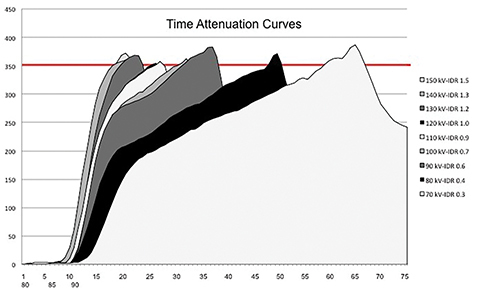 Time attenuation curves in the second phase of the experiment showed a similar narrowed shape (Figure 5). In parallel with this single-energy assessment of contrast media dynamics, we also performed a comprehensive evaluation of aortic CT angiography in dual-energy mode reconstructing virtual monoenergetic images from 40 to 120 keV and lowering the contrast media amount from 60 mL to 10 mL in 5 mL increments for each keV setting. We performed a dynamic acquisition without table feed for 50 seconds, injecting the contrast media at a fixed IDR of 1 gI/s. Our preliminary results show that image reconstructions at low keV level (40–50 keV) allow for diagnostic enhancement with 15mL of contrast media. Subsequently, we applied the result of the experiment performed in single-energy mode to a standard prospective CT angiography protocols to demonstrate its clinical feasibility. Results suggested the feasibility to sensibly lower the amount of contrast media we are currently using at each kV level, down to 25 mL at 70 kV in a simulated clinical acquisition of 12 seconds. Based on these promising results, we are now refining the amount of contrast media needed for our coronary CT angiography protocols. Preliminary results are demonstrating that the reduction of contrast media based on specific kV and keV is feasible and can be safely used in clinical practice. Low kV and keV contrasted CT exams are feasible in clinical routine and can be used to save both radiation and iodine dose simultaneously. Our results show that it is possible to further optimize contrast media injection parameters, tailoring the contrast media volume and the flow rate based on the automatically selected tube potential with single-energy acquisitions and the specific monoenergetic level with dual-energy acquisitions. The definition of an optimal injection protocol using the minimal amount of contrast media necessary for each exam is still being actively investigated by several groups and further advances moving towards a patient-tailored CT examination are expected in the near future. Nonetheless, these preliminary achievements will begin allowing physicians to individually tailor contrast media volumes, in the same fashion they do with every drug in clinical practice, all in pursuit of making CT a gentler and safer imaging technique. Rengo M, Caruso D, De Cecco CN, et al. High concentration (400 mgI/mL) versus low concentration (320 mgI/mL) iodinated contrast media in multi detector computed tomography of the liver: a randomized, single centre, non-inferiority study. Eur J Radiol. 2012;81(11):3096-3101. Meyer M, Haubenreisser H, Schoepf UJ, et al. Closing in on the K edge: coronary CT angiography at 100, 80, and 70 kV-initial comparison of a second- versus a third-generation dual-source CT system. Radiology. 2014;273(2):373-382. Schindera ST, Graca P, Patak MA, et al. Thoracoabdominal-aortoiliac multidetector-row CT angiography at 80 and 100 kVp: assessment of image quality and radiation dose. Invest Radiol. 2009;44(10):650-655. Krazinski AW, Meinel FG, Schoepf UJ, et al. Reduced radiation dose and improved image quality at cardiovascular CT angiography by automated attenuation-based tube voltage selection: intra-individual comparison. Eur Radiol. 2014;24(11):2677-2684. Spearman JV, Schoepf UJ, Rottenkolber M, et al. Effect of automated attenuation-based tube voltage selection on radiation dose at CT: An observational study on a global scale. Radiology. 2016;279(1):167-174. Mangold S, Wichmann JL, Schoepf UJ, et al. Automated tube voltage selection for radiation dose and contrast medium reduction at coronary CT angiography using 3(rd) generation dual-source CT. Eur Radiol. 2016;26(10):3608-3616. Mangold S, De Cecco CN, Wichmann JL, et al. Effect of automated tube voltage selection, integrated circuit detector and advanced iterative reconstruction on radiation dose and image quality of 3rd generation dual-source aortic CT angiography: An intra-individual comparison. Eur J Radiol. 2016;85(5):972-978. Flohr TG, McCollough CH, Bruder H, et al. First performance evaluation of a dual-source CT (DSCT) system. Eur Radiol. 2006;16(2):256-268. So A, Hsieh J, Imai Y, et al. Prospectively ECG-triggered rapid kV-switching dual-energy CT for quantitative imaging of myocardial perfusion. JACC Cardiovasc Imaging. 2012;5(8):829-836. Hidas G, Eliahou R, Duvdevani M, et al. Determination of renal stone composition with dual-energy CT: in vivo analysis and comparison with x-ray diffraction. Radiology. 2010;257(2):394-401. Schwarz F, Ruzsics B, Schoepf UJ, et al. Dual-energy CT of the heart--principles and protocols. Eur J Radiol. 2008;68(3):423-433. Sudarski S, Apfaltrer P, Nance JW, Jr., et al. Objective and subjective image quality of liver parenchyma and hepatic metastases with virtual monoenergetic dual-source dual-energy CT reconstructions: an analysis in patients with gastrointestinal stromal tumor. Acad Radiol. 2014;21(4):514-522. Grant KL, Flohr TG, Krauss B, et al. Assessment of an advanced image-based technique to calculate virtual monoenergetic computed tomographic images from a dual-energy examination to improve contrast-to-noise ratio in examinations using iodinated contrast media. Invest Radiol. 2014;49(9):586-592. Albrecht MH, Trommer J, Wichmann JL, et al. Comprehensive comparison of virtual monoenergetic and linearly blended reconstruction techniques in third-generation dual-source dual-energy computed tomography angiography of the thorax and abdomen. Invest Radiol. 2016;51(9):582-590. Caruso D, Eid M, Schoepf UJ, et al. Optimizing contrast media injection protocols in CT angiography at different tube voltages: evaluation in a circulation phantom. Journal of Computed Assisted Tomography. 2017;IN PRESS. De Cecco CN, Schoepf UJ. New contrast injection strategies for low kV and keV imaging. Appl Radiol. 2018;47(1):7-11. Dr. De Cecco and Dr. Schoepf are Radiologists in the Division of Cardiovascular Imaging, Department of Radiology and Radiological Science, at the Medical University of South Carolina, Charleston, SC. Dr. Schoepf receives institutional research support from Astellas, Bayer, GE, and Siemens. Dr. De Cecco receives institutional research support from Siemens. Dr. Schoepf and Dr. De Cecco have received consultancy fees from Guerbet. Dr. Schoepf has received consultancy fees from Bayer.